Compact, easy, upgradable OTDR kit for installing and troubleshooting optical fibers across premises, FTTA, and FTTH networks. The JDSU SmartOTDR™ is a compact, easy, upgradable OTDR test solution based on the T-BERD/MTS-2000 platform that eliminates setup errors that are the cause of fiber retests and repeatedly dispatching technicians. The SmartOTDR guarantees accurate, consistent, and repeatable results every time for technicians of any skill level. 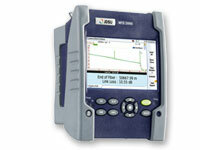 Easy OTDR user interface displays setup, test, storage, and result data on one screen eliminates having to change menus. Predefined or customized SmartConfig™ eliminates 100% of common OTDR setup errors. Less training, increased productivity, and many scalable future upgrade options such as Expert Mode or SmartAccessAnywhere. Get up poles and down holes quickly and easily with a light, portable and compact, hands-free design.